Put a bunch of high school students into the National Archives, focus them on Record Group 393, Part 1, volume 298, and sit back and watch. And, among other things, a clear indicator of the way that history can be taught that isn’t just a dull-as-dishwater list of names and dates and places. And the projects the students have undertaken have been amazing. But The Legal Genealogist knows you will understand if I focus on another of their projects. It started with the realization that the Civil War Washington website had an interactive map that displayed the bawdy houses of the Civil War era, and it had the names of the owners — but nothing more than that. So the students took it the next step. They found, first, a Special Order during the Civil War: Special Order 107 (April 18, 1862), calling for regulation of the houses, including an inventory and subsequent raids (May 2, 1862 and 1864). That was in Record Group 393: the Records of United States Army Continental Commands, 1821-1920. From the register of bawdy houses created as a result, the students went on to locate and digitize the court records from Record Group 21: Records of District Courts of the United States. And these records are now online for anyone to read and use. You can see how Ellen Dean, alias Ellen Wolf, alias Ellen Reynolds, was charged in April 1864 with keeping a bawdy house: the indictment itself is available online. You can see how the Chief Justice of the Superior Court of the District of Columbia issued a warrant for her arrest on the 14th of April 1864. You can see how Lizzie Brown and Kate Mullen and Mary Jane Smith were summoned as witnesses. You can see the records of the cases against Nelly Matthews (“It was a common trend back then to slightly alter your name to confuse the authorities, and Nellie Matthews was one of those women”), and Sally Austin (“one of the longest lasting bawdy house owners during the Civil War, being featured in city directories and court cases in all four years between 1862 and 1865”), and Mary Ann Hall (“Arguably the most successful bawdy-house owner and prostitute in the early 1860s, Mary Ann Hall’s estate was worth what is today’s equivalent of about $1.9 million”). 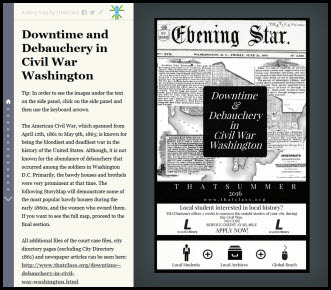 The students combined newspaper research, court records, city directories and more to put together a thoroughly entertaining — and scholarly — online map-driven presentation. We focus so much on hands-on education in sciences, technology and math. These kids show what can happen when we focus on hands-on education in our own history. And it’s something we need so much more of. Kudos to the students, their teachers, and the sources of their funding, including the D.C. Public Library. I would have remembered more history when it was taught if I would have been doing genealogy at the time. This sounds like a program which could (and probably should) be applied to many/all local records archives! What a creative way to get things “organized” by students young enough to use the technology well—and who stand to gain a lot of historical information from the original sources!! In my genealogical research, finding the original records is very high on my list of “thrills” in searching for my family members who predeceased me!! I’ve got goosebumps, Judy! What a marvellous experience for everyone involved. History – it’s all stories when students’ curiosity is piqued. Thanks for posting about this programme.